The VendingMiser® and CoolerMiserTM family of products are a breakthrough in the power management of cold beverage vending machines. Energy Miser products can reduce the electricity use of cold drink vending machines and reach-in coolers by up to 40% and save your business over $100 in electricity costs per vending machine annually. El Paso Electric customers are eligible for installation of energy saving devices at a reduced cost. 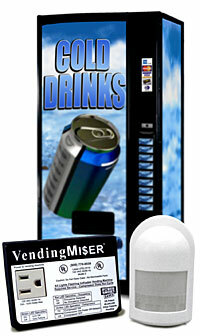 VendingMiser® is an amazing product that will reduce the power consumption of a cold drink vending machine by an average of 46% with no impact on sales or drinks. Examine the details of this exciting product below. CoolerMiserTM, a new addition to the Miser family, controls glass-front coolers that contain non-perishable goods. Machines suitable for control by CoolerMiser typically have glass sliding doors or pull-open doors. CoolerMiser can operate stand-alone, or it can be a perfect companion to the powerful VendingMiser. *Rebate will be in the amount shown above or up to the cost of the equipment (whichever is less).